WASHINGTON – After years as the dominant state delegation on Capitol Hill, Texans in Congress are bracing for a marked decline in political clout in Washington. For the past two terms, Texas Republicans wielded an unmatched seven committee gavels within the U.S. House and saw U.S. Sen. John Cornyn become the highest-ranking Texas senator since Lyndon Baines Johnson. But that power will begin to wane in the coming months, even if Republicans manage to keep control of both chambers. It was inevitable, and members saw this transition coming for years. "It certainly puts Texas in a position of reduced influence for the GOP conference as a whole and Congress in general," said U.S. Rep. Bill Flores, R-Bryan. "So I’m hopeful that we’ll be in a position to quickly regain some chairmanships because of the size and strength of the delegation." Flores is an example of the generational transition taking place. First elected in 2010, he will soon become one of the more senior members of the delegation as eight Texans in the U.S. House are not running for re-election, ensuring that the largest class of Texas freshman in recent memory will come to Congress next year. The group will lack choice committee assignments, institutional knowledge and seniority. The root of much of this transition is the GOP's rules on term limits for leadership posts, which encourage more of its members to become chairs when the party controls the House. Republicans climb the congressional ranks quickly – but their time at the top of the Hill is finite. Of the seven Texas U.S. House chairmen, three will be termed out in January: U.S. Reps. Jeb Hensarling of the House Financial Services Committee, U.S. Rep. Michael McCaul of the Homeland Security Committee and U.S. Rep. Lamar Smith of the Science, Space and Technology Committee. Hensarling and Smith are retiring, along with other fixtures of seniority: U.S. Reps. Joe Barton, R-Ennis; Gene Green, D-Houston; Sam Johnson, R-Richardson; and Ted Poe, R-Humble. U.S. Rep. Beto O’Rourke, a relatively junior member of the House Armed Services Committee, is vacating his seat to run for U.S. Senate. And then there is the Senate situation: Cornyn faces a term limit in his post as U.S. Senate majority whip. Yet his political future remains promising. U.S. Senate Majority Leader Mitch McConnell announced earlier this summer he intends to keep Cornyn within the leadership circle. Many delegation Republicans are hopeful he might one day ascend to the GOP leader position in the Senate. Back in the House, loss in seniority may not just come from retiring chairmen. Three Texas Republicans who Democrats are targeting also hold important slots. U.S. Rep. Pete Sessions, R-Dallas, is the House Rules Committee chairman – a post that lacks term limits but serves at the pleasure of the GOP house leader. Also facing strong challenges: U.S. Reps. John Culberson, R-Houston, and John Carter, R-Round Rock. The two men are senior members of the House Appropriations Committee – a key jurisdiction when it comes to securing Hurricane Harvey relief funding. That those three congressmen – all in districts that were considered safe Republican territory until this election cycle – are becoming part of the worried calculations within the Texas GOP delegation is indicative of the growing sense on Capitol Hill that Democrats could take back control of the House this fall. Should that happen, the remaining chairmen will lose power and become ranking members. Several GOP delegation sources interviewed for this story were quick to reinforce that several chairmen will all but certainly be their party’s highest-ranking members on key committees next term should Democrats win control of the chamber: U.S. Rep. Mac Thornberry of Clarendon on the House Armed Services Committee, U.S. Rep. Kevin Brady on the House Ways and Means Committee and U.S. Rep. Mike Conaway of Midland on the House Agriculture Committee. And there are other potential chairs on deck. While McCaul is moving out of the homeland security realm, he is in contention to run a different committee: the U.S. House Foreign Affairs Committee. 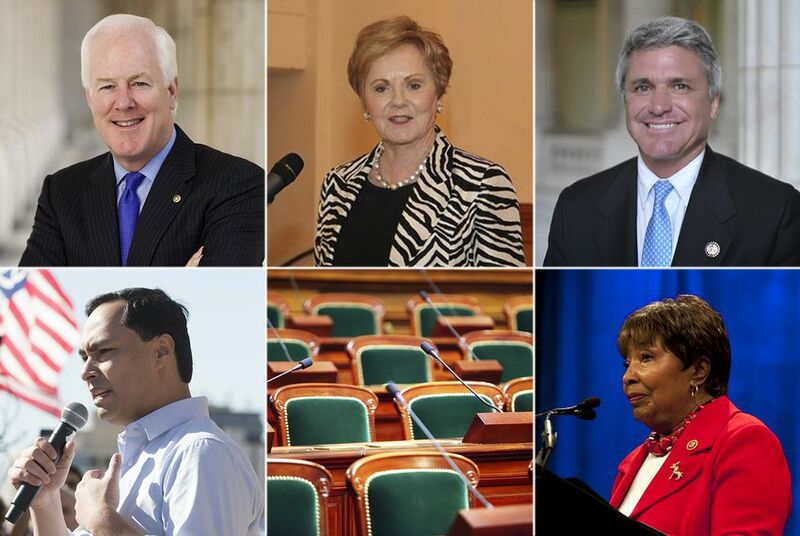 But the biggest chair race of all involves another Texan – U.S. Rep. Kay Granger of Fort Worth. If not for the battle to succeed U.S. House Speaker Paul Ryan as the leader of House Republicans, her fight to become the chairwoman of the U.S. House Appropriations Committee would be the most exciting political contest in the GOP conference. Multiple sources say there are no assurances she will win the position, but she is, without question, a top contender. However, if Democrats take control of the chamber, all of these GOP calculations become essentially moot. Fights over chairmanships will become battles for the relatively neutered position of committee ranking member. U.S. Rep. Joaquin Castro, D-San Antonio, is a third-term member who is on the leadership ascent within his caucus. He argues that Texas Democrats will hold power – just not on the scale of the current state of the GOP side. Based on multiple interviews, U.S. Rep. Eddie Bernice Johnson, D-Dallas, is the only Texan likely postured to become a chair — of the House Committee on Science, Space and Technology — in a Democratic takeover. Democrats do not have term limits on leadership roles and usually prioritize seniority over nearly all other considerations. Furthermore, while it is not a formal committee position, Castro is on track to become the chairman of the Congressional Hispanic Caucus, a powerful voting bloc within the Democratic side. Perhaps it’s making the best of an unpleasant situation, but some delegation sources suggest there is a silver lining to the transition. Those seven gavels from Texans have been something of a source of resentment for House Republicans from other states. So much so, it was a key argument against Brady’s ultimately successful bid to run the House Ways and Means Committee. And Democrats and Republicans alike argue that Texas will never be ignored, no matter rank or seniority. It is simply too large a group — 38 members now and, due to strong population growth, more to come in next decade’s reapportionment — to not have a major say in national policy. Those Texans are scattered all over the committees and will almost always have a voice when sorting out policy — even if it is just at the rank-and-file level. And despite the nastiness and partisanship of this past term, a number of the members bonded over their work following Hurricane Harvey and they insist the delegation will always find a way to come together amid a crisis. Yet they concede it’s highly unlikely any of the freshmen joining the delegation will earn their first choice in committee assignments. “We’re going to have to earn that back,” said Green, referencing the lost seniority. “You have to pay your dues, so to speak,” the Houston Democrat added. Flores, the Bryan Republican, concurred. “We do have some good members coming in, and I think we’re going to be okay,” he said. “But for at least a Congress or two, we are not going to have nearly the influence we have today."